Colorful. Credible. Necessary. These are the words that describe my feelings about Francie Latour’s debut picture book, Auntie Luce’s Talking Paintings. “Colorful” because both the text and the artwork are equally vivid and evocative. “Credible” because of the many nuanced details in this culture-rich story, written about a Haitian-American by a Haitian-American. “Necessary” because children’s books centered in Haitian culture have historically been few. And it’s time for that to change. The Brown Bookshelf is pleased to shine today’s spotlight on author and co-founder of Wee The People, Francie Latour. My path to getting a book deal was very random. I didn’t seek it out. I never thought I was capable of writing a book, for kids or otherwise. Back in January 2010, I wrote an essay right after the earthquake in Haiti for the Boston Globe, where I worked for a number of years. That piece itself almost never happened; I blew several deadlines trying to find my way through it. It eventually ran in the form of fragmented diary entries. A children’s book agent, Rubin Pfeffer, read that essay and asked to meet with me. He asked if I would try writing a children’s book. I laughed out loud at that. It made me uncomfortable, because I didn’t want to try to do it and then fail. I wrote the manuscript that same year. So, still 2010. For the next five years, nothing happened. Rubin stayed in touch and continued shopping it around. I made myself forget about it because again, it felt like failure. Then out of the blue, in 2016, Rubin emails me to tell me there were TWO publishers that wanted it. Only one of the two houses agreed to my condition to only consider Black illustrators. That was Groundwood Books. And that’s the story of how I got my book deal. With children’s books, I am drawn to books that are quietly powerful, where you really see how less can be more. Bao Phi’s and Thi Bui’s A Different Pond does that. So does Two White Rabbits by Jairo Buitrago and Rafael Yockteng. I’m also really drawn to artists whose work elevates/celebrates Black experience in its complexity. So, visual artists like Lorna Simpson, Carrie Mae Weems, Rashaad Newsome, Ebony Patterson, Lorraine O’Grady, and the Gees Bend quilters, performing artists like the Alvin Ailey Dance Company, and writers like James Baldwin, Edwidge Danticat, and Toni Morrison. I’m also inspired by artists who are deeply driven, and who use that drive to bring people together, like the way people gather around a fire. I’ve been really lucky to find artists like this here in Boston. There’s a Haitian dance company here, Jean Appolon Expressions, whose founder, Jean, overcame incredible obstacles – racism, homophobia, the journey of immigration – to create this deeply Haitian but also open and communal experience of dance. I’m also a huge fan of Ife Franklin, a textile artist who builds replica slave cabin installations with wood boards that are wrapped in this gorgeous hand-dyed indigo fabric. People from the community – old, young, Black, White, gay, straight – come together to dye the fabric and wrap the wood. I’ve done it with my kids and it’s the closest feeling I’ve had to putting my hand on this brutal, painful history and helping to heal it. All of these artists have taught me that there is no one way to be Black. 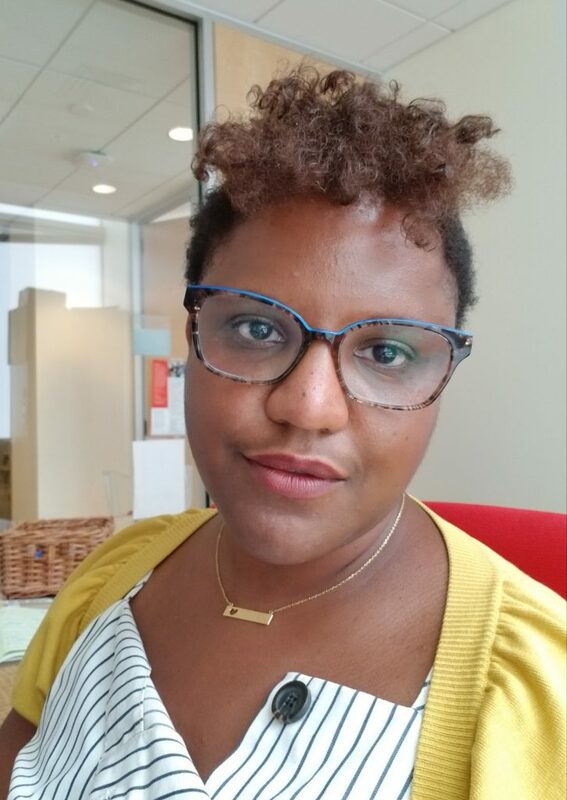 For a bougie Black girl who grew up in the suburbs skating on this hyphen of Haitian-American identity, that’s extremely powerful. As a former news reporter, I was trained to write about what’s already happened, in reality. So for me it was hard and is hard to think about creating a fictional story. My process basically is to just surround myself with images and text that have to do with what I want to write about. Lots of art books, Google images, music, and so on. I also have this deep love of language and words. So as I’m immersing myself in all this, at some point a word or chain of words will surface that helps my writing catch fire. For revising, I really lean on others. At a certain point you can’t really see your own writing. It’s like trying to push a bus you’re inside of. So I show it to a lot of people, some who are writers and some who are not writers, because I want and value those different responses. 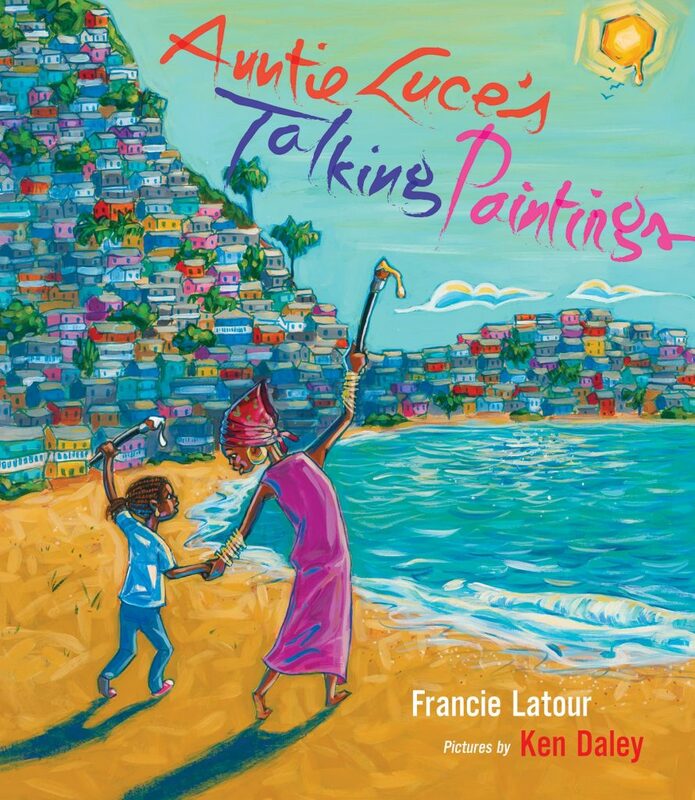 For more information on Francie Latour and Auntie Luce’s Talking Paintings, visit her website and Facebook page. Francie is such a gift to us all, especially here in the Boston area. She enables young children to SEE THEMSELVES in texts. She is a movement maker and I’m so very fortunate that she is here with us. Yay, Francie!!!! WOW – many debut authors are afraid to ask for what they want, but this author stuck to her guns about an illustrator, and boy, didn’t THAT pay off. What a beautiful collaboration.